I don't know what happened today, I woke up to brilliant sunshine, I have to leave soon and it's started raining! It's not stopping me wearing my beloved pastel colours though! I decided to edge it up a bit today, if you can call it that. 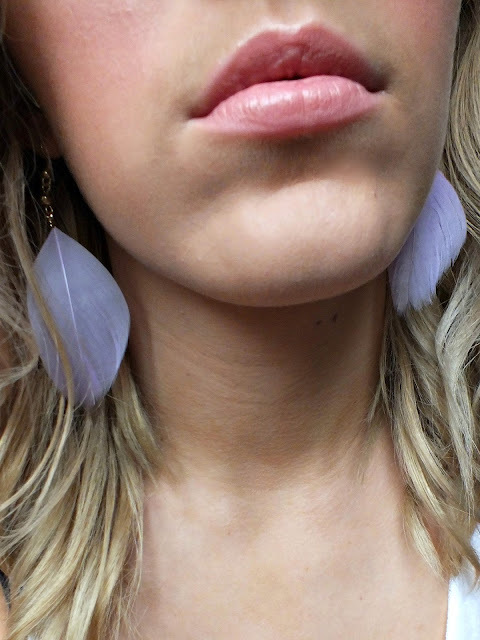 I'm wearing my pretty lilac jeans with girly feather earrings, with a band top and leather jacket. I like outfits like this, I often go all girly and sweet but every now and again I like to have a bit of an edge to my outfits! btw - I don't know why I look like I've had a bad patchy spray tan in the last photo - I took this one in my bedroom and the lighting was all kinds of awful thanks to the rain - soz! Anyway gotta rush off in the rain to college now!